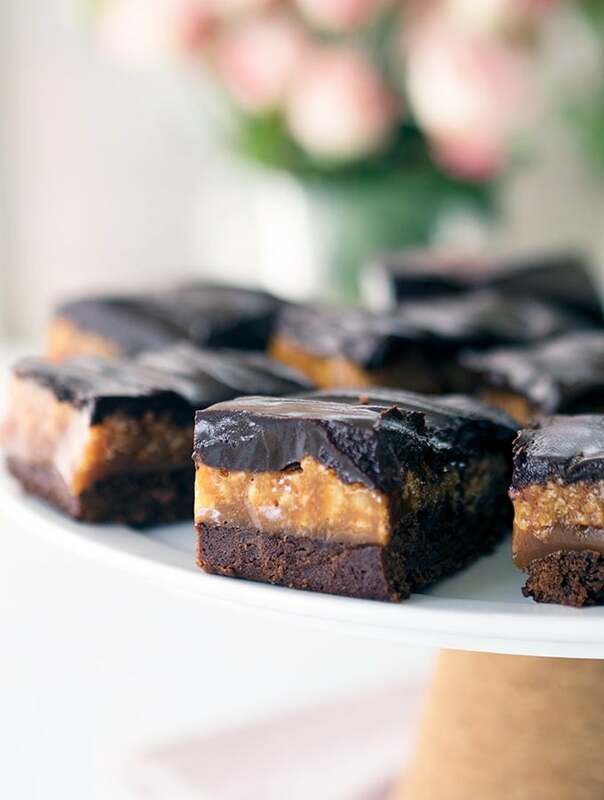 Home » Caramel Crunch Brownies – Rich, Decadent & Delicious! Caramel Crunch Brownies, or should that be Caramel Crunch Bars? 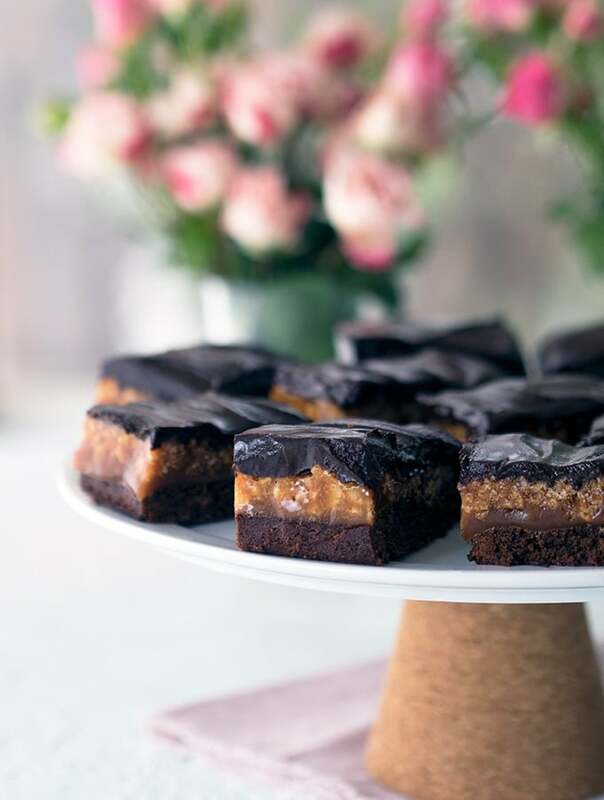 Dense chocolate brownie base slathered in creamy caramel crunch and then topped with thick rich dark chocolate ganache. There is always a box of rice bubbles (rice crispies) in my pantry. We don’t eat them for breakfast, they are totally utilised for cooking. Usually finding their way into recipes that involve chocolate. I love the texture and crunch that puffed rice cereal adds to chocolate. It is probably one of the simplest ways to add interest and texture to chocolate. In this case they were used to make the caramel crunch in these caramel crunch brownies. You will find recipes for caramel crunch brownies, caramel crunch bars and chocolate crunch bars all of the internet. This particular recipe has been adapted from Donna Hay’s caramel crunch brownie recipe. I’ve adapted the recipe as, to be quite frank, the Donna Hay recipe weights and temperatures were a little out of whack. If somebody from the Donna Hay team is reading this, 160 Deg C does not equal 350 Deg F.
To be honest the Donna Hay mistakes made me feel good. Okay, so that sounds rather sad on my part, but It showed that being a blogger or a National magazine, we all make mistakes. I know that the wonderful Belly Rumbles’ readers email me on the odd occasion. “Sara, where do I add the vanilla? You mention it in the ingredients, but not the method.” I really do try to not stuff things up guys, but it does happen. Once something goes to print there really isn’t much you can do about it. What surprises me is that the corrections haven’t been made to the online version of Donna’s recipe…. 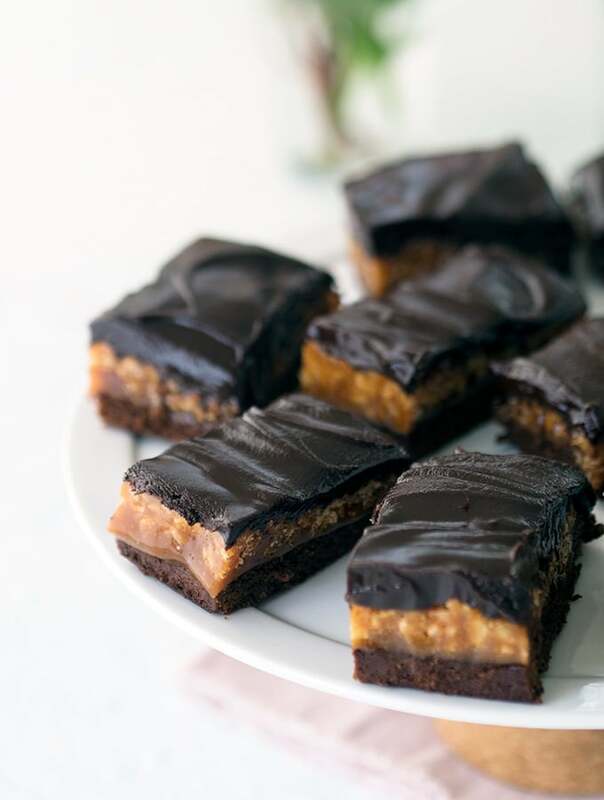 These caramel crunch brownies are rich and decadent. The caramel is creamy with the fun crunch of puffed rice. Sandwiched between a dense dark chocolate brownie base and a generous slathering of rich dark chocolate ganache. Watch the timing when cooking. Check brownie with a skewer around the 15 minute mark. I used a 23cm (9 inch) square tin as it was the one I own which has a removable base (push tin). You could use a 20cm (8 inch) tin for a thicker base if you would prefer, but the cooking time will be a little longer, around 25 minutes. When first dissolving the sugar over a low heat brush any sugar crystals from the sides of the saucepan with a wet pastry brush. This will help prevent your caramel crystallising. Have cream and butter ready to add to the sugar mixture as soon as it gets to temperature. Use a saucepan which will give you ample room for the caramel to bubble up when adding the cream and butter. It will bubble up quite dramatically, be very careful to not burn yourself from the steam it creates as well. It is essential to use a whisk to incorporate the cream when pouring it into the sugar mixture. I find it easiest to add the cream first, whisk that in, and then add the butter. To avoid burning the ganache melt the chocolate into the cream over a low heat. I tend to remove the saucepan from the heat and continue to mix. Placing it back on the heat if needed to continue melting the chocolate. Using grated chocolate, or finely chopped chocolate will also make the task easier. 23cm (9 inch) loose base square cake tin. Having a loose base (push tin) will make your life so much easier when it comes to removing the caramel crunch brownies from the tin. If you don’t have a square loose base tin, you could use a round one. Cut the caramel crunch brownies into thin wedges instead of bars or squares. I use a candy thermometer that hooks on to the side of my saucepan. This allows me to leave it in the bubbling sugar mixture permanently while cooking. Most candy thermometers come with some sort of hook or attaching method. All ingredients for this recipe are probably in your fridge and pantry right now. In regard to the chocolate ganache, use a good quality chocolate that you like the taste of. I used a dark chocolate which was 70% cocoa. These caramel crunch brownies are rich, a small piece goes a long way. There will be leftovers unless you are making this for entertaining. Store unrefrigerated in an airtight container and best eaten within two days. Alternatively, they will keep in the fridge for longer, which is where my leftovers are right now. But it is important to note that the ganache may discolour a little and the caramel will become rock solid. If you are going to eat all of the caramel crunch brownies within two days, my advice is don’t refrigerate. Preheat oven 180 Deg C (350 Deg F). Grease a 23cm (9 inch) loose base square cake tin and line with non-stick baking paper. Place chocolate, butter and vanilla bean paste in a small saucepan. Over a low heat melt butter and chocolate, stirring until completely melted and smooth. Remove from heat and set chocolate mixture aside. In a medium bowl place sugar, eggs, flour and cocoa. Pour in chocolate mixture and mix until well combined. Pour brownie mix into the prepared cake tin. Place in oven and bake on the middle rack for 20 minutes or until set. Allow the brownie base to cool in the tin. Place sugar and water in a medium saucepan. Over a low heat stir the sugar mixture until the sugar has dissolved. Brush any sugar crystals from the sides of the saucepan with a wet pastry brush. Once sugar has dissolved hook candy thermometer to the inside of the saucepan. From this point on do not stir the sugar mixture. Turn up the heat and bring the sugar mixture to the boil and cook for 10 minutes or until the sugar mixture starts to turn a dark golden caramel colour and reaches 180 Deg C (350 Deg F). Remove from the heat and whisk in cream and butter until well combined. Stir through the puffed rice cereal. With the brownie base still in the tin, pour the caramel crunch mixture over the top of the brownie base, smooth the top. Set aside for around 30 minutes until the caramel crunch is almost set. Place chocolate and cream in a small saucepan. Over a low heat stir until the chocolate has melted into the cream and the mixture is smooth. Pour ganache over the caramel crunch layer. Leave to cool at room temperature for around 3 hours or until set. Cut into bars to serve. Yum, who could not fall in love with this decadent little sweet..
oh awesome I’ve got some rice bubbles leftover that I can now use up! Wow! Such a delicious post and mouthwatering brownies you shared. Thank you so much for sharing a great information and post. Gorgeous photos and delicious recipe! Love every single layer of these brownies – especially the crunch part! Yum! 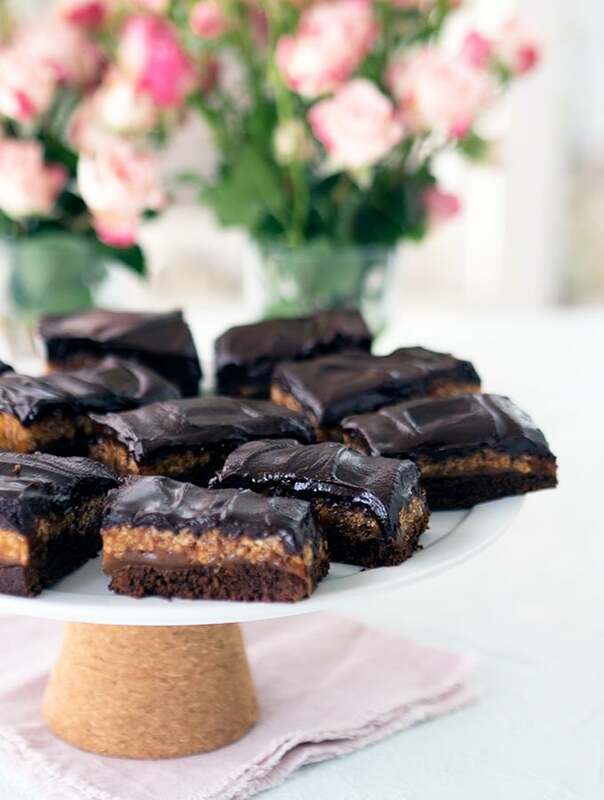 Everything about this recipe is so decadent – definitely a must try! What a great way to add some crunch to a gooey brownie. Love the the layers of the brownie as well. wow talk about decadent these are over the top fudge looking. I bet I still could eat the whole plate! These brownies look and sound to-die-for! They’d be a such a tasty teatime or party treat. Need to try this recipe!